I love auto racing. To be more specific, I'm a NASCAR fan. Yeah, I'm one of those guys. I love watching souped up race cars drive around a track in circles for three or four hours, I used to watch the races when I was a kid. It was really exciting, though I thought the most exciting parts were when the cars wrecked. I was too young to realize that the drivers could actually get hurt. When I was older, I figured out the strategy involved in NASCAR racing. Everything from the engines, the body styles of the different cars, fuel economy, tires, and the handling of the cars could all affect the outcome of the race. And the personalities of the drivers, and driving styles, certainly made a difference in who you might root for. There were heroes and villains, good guys and not so good guys. NASCAR racing is so much more than just cars doing circles around a track. I didn't know the names of very many drivers when I was a kid, but I figured out who I liked. Cale Yarborough was a favorite, but that was because he guest-starred on one of my favorite TV shows, THE DUKES OF HAZARD. During the 80s, Cale was sponsored by Hardee's, so Hardee's became my favorite fast-food place. I was an hones victim of the marketing of the day. Another driver I liked was Harry Gant, sponsored by Skoal (a chewing tobacco). I just knew he won races and, at that time, drove an Oldsmobile, which was my favorite kind of car. I had no idea back then the issues with smoking or tobacco, or the relationship between Winston, a maker of cigarettes, and their role as the major sponsor of NASCAR's top racing series. I followed NASCAR off and on, and in the early 90s, I was invited by a friend to go to a NASCAR race at Watkins Glen, NY, one of two road courses on the NASCAR circuit. Road courses were really cool because they weren't just ovals. The drivers made left and right turns, and the track changed elevation and was much longer than the rest of the tracks. I then became a die hard fan. There is nothing like seeing a race live and in person. You gain such an appreciation for the work that these drivers put into their craft, the complexity of the cars, and everything involved in racing. Plus, every driver has a merchandise trailer full of hats, t-shirts, jackets, license plate frames, stuffed animals, lunch boxes, and so much more. I also got my first autograph. There was a driver standing just outside of the pit area of the track, and I was able to get his signature on my race program. 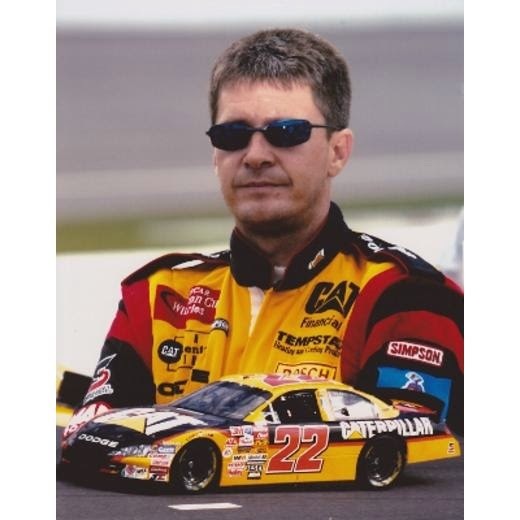 It was Ward Burton. I had never heard of him. He drove the #22 MBNA America Pontiac Grand Prix. I just happened to have an MBNA America t-shirt and decided to wear it to the race. Ward became my favorite driver. While he didn't do very well in the race, I was excited to have someone to root for. I found out more about him, and his conservation work in Virginia, and that he was a really great guy. He had only won one race in his career in NASCAR's top series. I also found out he had a more successful and popular younger brother, Jeff. I became completely engrossed into the NASCAR life, watching every race, memorizing all of the drivers, their car numbers, their sponsors, and all of the tracks. Ward continued to drive the #22, and after getting a new sponsor, Caterpillar, he began winning more races. When I started dating Teresa, she and I would spend our Sunday afternoons after church watching the races on TV, and she became a fan, as well. In our 2nd year of marriage, we were given tickets to the NASCAR race in Las Vegas, and we had a fantastic little vacation highlighted by the race, Teresa's first live race. The pinnacle of our fandom, though, was when Ward won the 2002 Daytona 500. It was so exciting. Anyway, my interest waned when Ward retired from driving, not too long after Teresa's death. I lost interest in NASCAR, especially as the rules changed and the same half-dozen drivers seemed to win every race. I really didn't have anyone to root for anymore, and that significantly affected my interest. Fast forward to this week. NASCAR is ready to kick-off the new season. 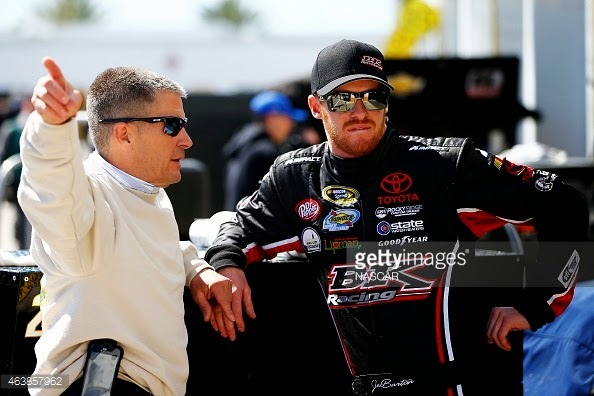 I discovered that Ward Burton's son, Jeb, who was now all grown up, was now driving at NASCAR's top level, and was preparing for his first race, I really got excited thinking the next generation of Burtons was about to start his career. And I got wrapped up in watching the qualifying races on Thursday night. My daughter, Melody, sat next to me and began asking me questions about the drivers, and I pointed out Danica Patrick, the only woman currently racing in NASCAR. From that point on, Melody took a great interest in the race, and she kept asking lots of questions. I found it amusing just how much interest she showed, and she was asking questions about what was happening on the screen. When Danica wrecked, she was upset, but that turned back into satisfaction when she was able to finish the qualifying race and actually make the Daytona 500. My little girl was fast becoming a fan! Unfortunately, Jeb Burton failed to qualify after sparking an accident of his own during the race, so he will not be racing on Sunday. While Danica isn't necessarily the best role model for Melody, and I deplore the Go Daddy ads that sponsor her, I'm really happy to see Melody take such as interest in racing, as well as take a rooting interest in such a strong female racer. She is a second generation NASCAR fan. Melody and I will watch the Daytona 500 together and root for Danica to win. I can hardly wait to take her to a race. Have a great, safe weekend! Good night, everybody!